Black holes have long been painted as eternal prisons, regions of space so dense that nothing — not even light — can escape them. But the truth, Stephen Hawking told a packed Sanders Theatre this afternoon, is that the holes aren’t as black as you might think. In a session that was the hottest ticket on campus in some time, the renowned Cambridge theoretical physicist and cosmologist spoke to more than 1,000 faculty, students, and staff at Sanders, with dozens more watching at simulcast sites in the Science Center and at Jefferson Lab. 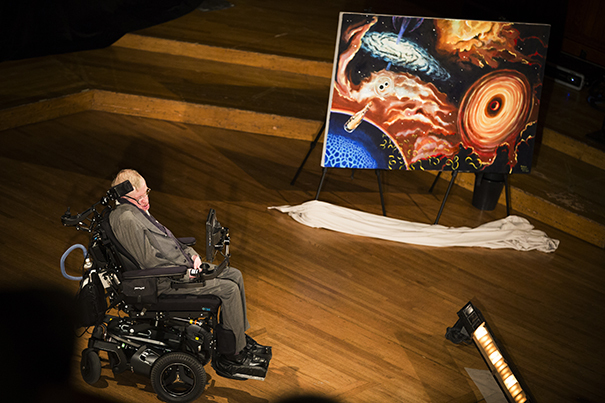 Hawking’s lecture focused on his research into black holes and the information paradox, which suggests that physical information is permanently lost in such holes, a controversial notion that violates the scientific tenet that information about a system from one time can be used to understand its state at any other time. Over the years, Hawking said, the murky nature of black holes has forced scientists to grapple with theories that can contradict each other and — in some cases — our basic understanding of the universe. Early theories argued that black holes retain virtually no information about the stars from which they formed, he said. Instead, only their mass, angular momentum, and electrical charge were preserved. Based on that theory, he explained, it appeared that identical black holes could be formed by an infinite number of different configurations of matter. Quantum mechanics, however, suggested the exact opposite by showing that black holes could only be formed by particles with particular wavelengths. If the information about the bodies that form black holes is not lost, Hawking said, then “black holes contain a lot of information that is hidden from the outside world. In early 1974, Hawking began to challenge that axiom when he discovered particles emitting from a black hole at a steady rate. That outflow, later dubbed Hawking radiation, was among the key ideas that revolutionized science’s understanding of black holes by suggesting that at least some energy could be emitted by the mysterious phenomena. In 1963, Hawking was diagnosed with a rare, slow-progressing form of Amyotrophic Lateral Sclerosis, and was given two years to live. Despite that diagnosis, he went to Cambridge University, where he would serve as the Lucasian Professor at Cambridge — a post once held by Isaac Newton — for three decades. Hawking’s contributions to understanding the universe have been called the most significant since Einstein. Hawking theorized correctly that black holes emit radiation. He was also the first to describe a theory of cosmology that united general relativity and quantum mechanics, and is an ardent supporter of the “many worlds” interpretation of quantum mechanics. As black holes emit particles, they will eventually lose mass, shrink, and disappear, but the question of what happens to the information they held remains. If that information is truly lost, Hawking said, that strikes at the heart of our understanding of science. “For more than 200 years, we have believed in the science of determinism, that is that the laws of science determine the evolution of the universe,” he said. “If information were lost in black holes, we wouldn’t be able to predict the future because the black hole could emit any collection of particles. Following the lecture, Hawking answered three questions from audience members, including one about his recently announced Breakthrough Starshot project, which aims to send probes to the nearest star system, Alpha Centauri. This entry was posted in Science, Space Exploration. Bookmark the permalink.